Herbicide injury caused by root-inhibiting herbicides such as dinitroanilines (including benefin, oryzalin, pendimethalin and trifluralin) and pyridine (such as dithiopyr). Root inhibitors are soil applied, preplant incorporated (ppi), at planting or post-transplant preemergence and assimilated by roots of germinating seeds (radical or seminal) and/or shoots prior to soil emergence. There is minimal to no translocation. Annual grasses are the primary target but some small-seeded broadleaf weeds are also controlled. Crops injury may occur from soil residual carryover from previous crops, excessive doses from misapplication or inaccurate sprayer calibration or foliar exposure. Cool, wet conditions are conducive to injury to some crops by soil-applied dinotraniline herbicides. 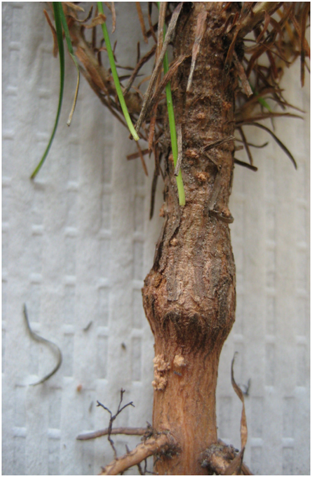 Stem girdling just at or below the soil line is often associated with stem swelling just above the soil line as seen in this photo of a pine seedling treated with oryzalin. 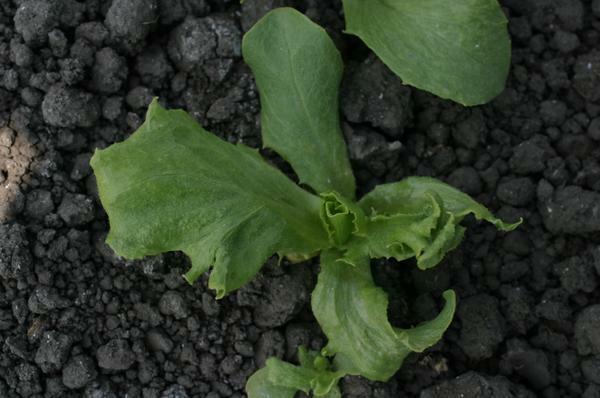 Leaf deformity on a lettuce seedling caused by pendimethalin. 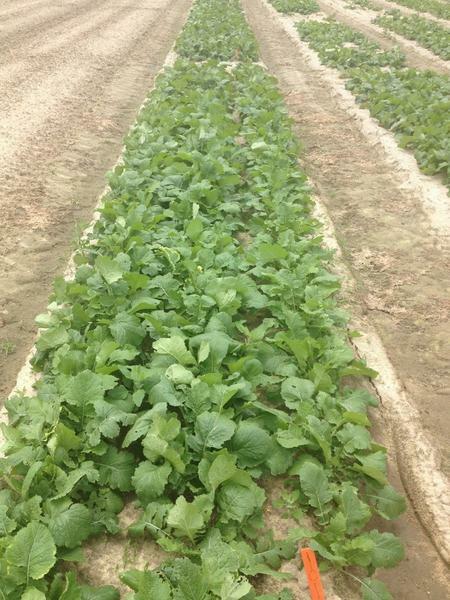 Turnip crop with normal stand and plant growth. 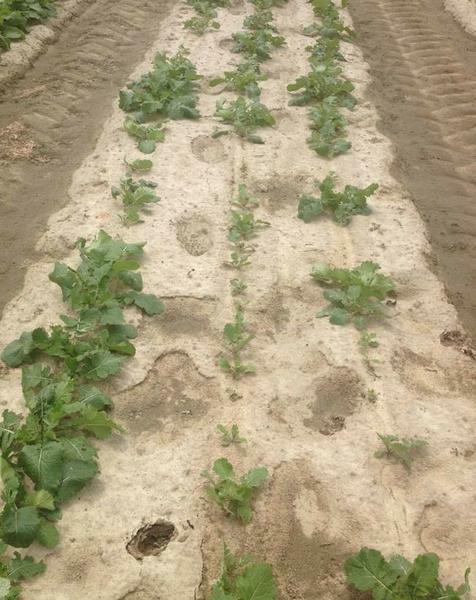 Turnip crop with stand thinning and stunted growth from Trifluralin at 3 pt/A 35DAT. 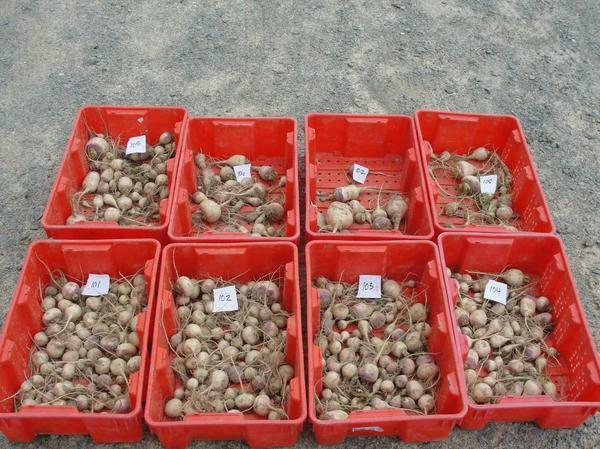 Turnip yield can be decreased by dinitroanaline herbicides such as trifluralin. Club-roots on a grass treated with prodiamine (a dinitroanaline herbicide). Swollen roots are still functional and with sufficient irrigation or rainfall such plants can survive and grow but lodge when roots cannot support the tops or die when soil dries. 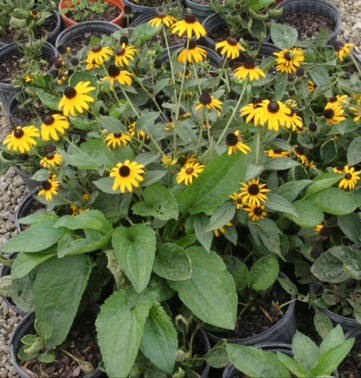 Rudbeckia treated with prodiamine + isoxaben. 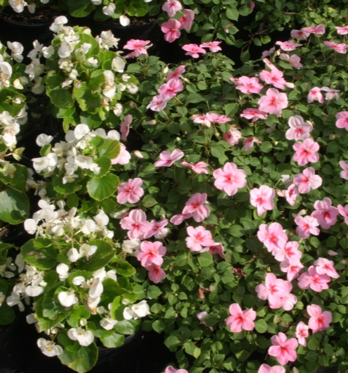 Flowering of some bedding plants can be reduced by foliar application of root growth inhibitors. Non-treated plant. 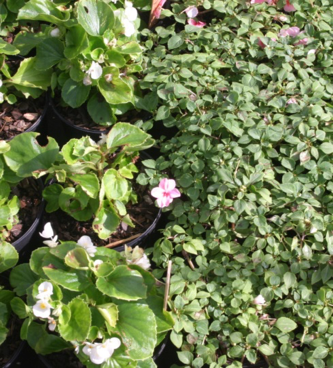 Flowering of some bedding plants can be reduced by foliar applications of root growth inhibitors. Dithiopyr EW treated plants. 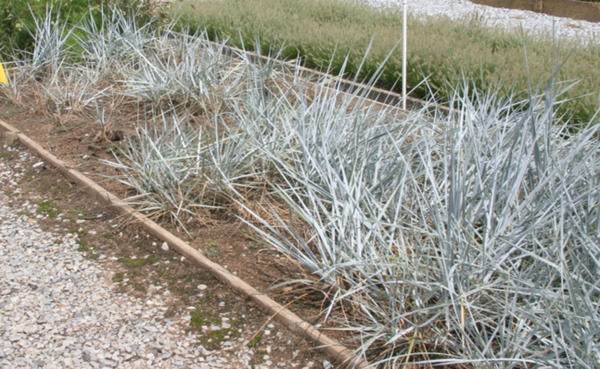 Stand thinning in an ornamental grass plant bed resulting from an application of prodiamine. Root inhibiting herbicide injury symptoms are often not observed as the roots of sensitive seedlings are quickly injured following emergence from the seed. Stems of sensitive plants that happen to emerged from the soil are weak and will soon lodge. Higher doses of dinitroaniline could present carryover for sensitive crops resulting in stand reduction and stunted growth. Some herbicides in these two families have up to 120 days half-life adding carryover concern. Stems of sensitive plants may be girdled at the soil line resulting in sudden wilting, stem breakage and death of treated plants. Foliar treatment can damage the youngest foliage present at treatment time, stunting bud development; older foliage and other buds are generally not affected. 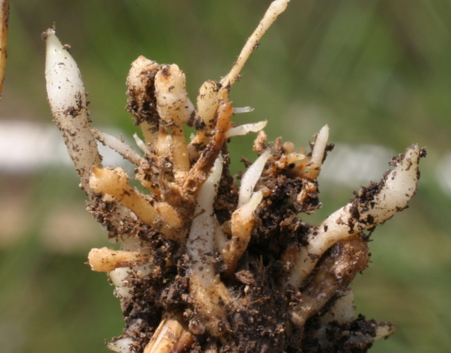 Urea or high-salt fertilizers applied at planting can damage roots resulting in seedling death. Stand reduction may resemble injury from parasitic nematodes or soil-borne diseases. Similar stem girdling may be caused by cellulose synthesis inhibitor herbicides like indaziflam. 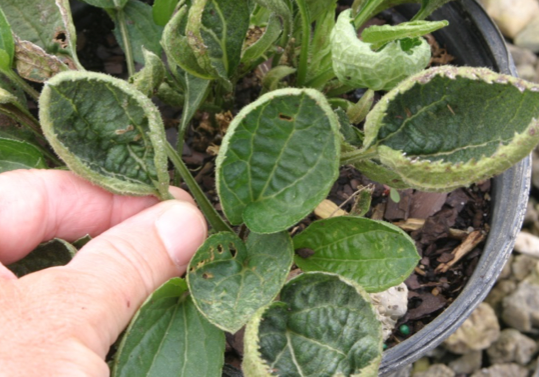 “Puckered” foliage may be similar to aphid damage, foliar damage from isoxaben, or early symptoms from synthetic auxin herbicides.